Vacation calories don’t count, right? Freshly-made Oregon Coast pastries, breads and other treats are here to entice you. When I’m on vacation, I shift into Indulgence Mode. I declare that I am “on holiday”: I sleep in. I dine out. I give myself permission to do whatever I want to do versus what I’m supposed to be doing. 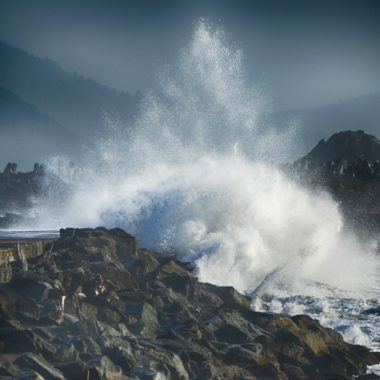 Nowhere is this on display more than on treasured escapes to the Oregon Coast. From rambling walks on the sand to lazy lunches to end-of-day rituals of watching the sun melt into the Pacific, I give free rein to my whims and wishes. That’s why I start every Oregon Coast vacation morning with a visit to a bakery. And, instead of the responsible, non-holiday choice (think “Morning Routine” bran muffin), I peruse the pastry case like I’m at a beloved bookstore and select whichever treat I truly want. Armed with my nearly felonious choice and a good espresso drink (and maybe that book I’ve been dying to read), I find a quiet spot to bask in my excess. I take my time, knowing that a precious, unscheduled, decadent beach day stretches before me. Following are a few of my favorite bakeries, followed by a few more from one of my editors, Emily Kolkemo. All that’s left for you to do is enjoy! As the music of Bob Dylan and the aroma of baked goodness cascaded over me, I sat at this much-loved Astoria institution and sipped a latte while nibbling on a savory croissant, stuffed with caramelized onions and asiago cheese. I took in the art—from the “flower” light fixture springing, blossom-like, from the ceiling to the heart-shaped swirl in my espresso drink—and concluded that this is bakery nirvana. 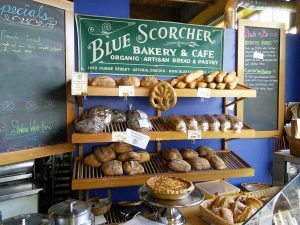 Blue Scorcher Bakery is an experience. Run as a cooperative, it uses organic, locally-sourced ingredients and claims to pay workers livable wages. In my mind, those are reasons enough to pay a little more for my coissant, and maybe stay a bit longer. You might want to grab a copy of Mother Earth News or Hip Mama from the bakery’s eclectic newsstand. Who knows? You may end up talking with another customer about heirloom vegetables or free-range parenting while you sip, munch, and read. That could be exactly what the Blue Scorcher experience is, at its fullest. And the quality doesn’t suffer here. Take the signature item—the marionberry scone. It’s huge, delicious, bursting with berries and a great value. 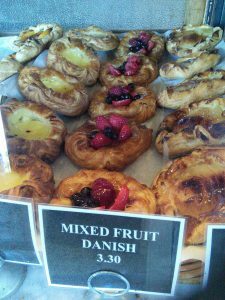 Other hard-to-pass-up goodies include chocolate croissants, mixed fruit danish, and fruit tarts. Granite-topped tables and wicker chairs lend a French ambiance that enhances your pastry-plus-cafe-au-lait experience. Outdoor seating is also available. John Allen, of the husband-wife ownership team, indicated that wife Lisa was home taking a nap, after coming into the bakery at 3 a.m.—a reminder that it ain’t easy running a from-scratch bakery. This unassuming spot on Seaside’s main drag perfectly mirrors this burg’s cotton-candy-beach-town personality. 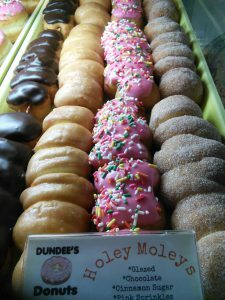 It offers all of the classic doughnut varieties: glazed and jelly-filled, maple and chocolate bars, apple fritters, twists, and buttermilk bars as well as their signature item, a sprinkled raised doughnut, glazed with pink (strawberry spiked!) frosting. Another pastry case reveals some surprises like their “extra large” croissant and likewise mammoth cookies. Dundee’s ranks high in the “most bang for your buck” category. If you haven’t gotten your complete bakery fix, you’ll be glad to know that owners Neil and Stacey Dundas also operate the restaurant next door—which features a doughnut burger on the menu! The Cannon Beach Historical Society establishes this bakery’s founding year as 1963, but co-owner Robin Christensen thinks it may go back to the ‘50s. Whether it’s been around 50 or 60 years, Cannon Beach Bakery’s baked goods are legendary. And for good reason. As Christensen says, “we do everything.” There are the traditional bakery treasures—glazed and cake doughnuts, maple bars and bismarcks, fritters and bear claws, and many off-the-beaten-path possibilities too: Swedish toscas bars, quiche, sailor jacks, and more. The piece de resistance is the Haystack Bread. 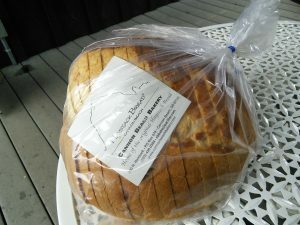 Named for (and resembling) Cannon Beach’s most prominent physical feature, Haystack Rock, this bread has been pleasing visitors for more than half a century. Make sandwiches and have a picnic. Where? Right there on the beach, of course, near its namesake. Co-Owner jason Menke spent his childhood summers visiting his grandmother in France, making daily treks to the local boulangerie and developing a fascination with French breads and pastries. 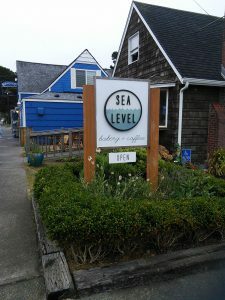 He and wife Liz opened Sea Level in 2014, after a crowdfunding campaign to assist with start-up costs. The signature pastry at Sea Level is kouign amann available in sweet and savory options. I sampled the “plain” variety, a melt-in-your-mouth pocket of goodness with layers of croissant-like-but-heavier dough, lightly sweetened and dusted with sugar. You could stop with the divine kouign amann, and Sea Level would be worthy of a visit. But you’ll want to explore their other offerings, including maple bourbon pecan rolls, blueberry rosemary scones, and their pain du chasseur (literally “bread of the hunter”), a pizza-like pastry with a variety of toppings. Bon appetit! If you think that naming your establishment the Grateful Bread Bakery might be just a gimmicky way to lure in Grateful Dead fans, think again. While it’s true that the perennially cheerful staff wears tie-dyed t-shirts and “deadheads” love the place, everyone else does as well. And what’s not to like? I had a ham and swiss cheese scone and it was—I am not making this up —the largest scone I have ever eaten. But it wasn’t just humongous, it was delicious. That applies to everything here in bakery heaven, from savory and sweet scones to cinnamon rolls, lemon bars, and so-big-you-really-should-share-them cookies. Despite the generous quantities and superb quality, prices are super reasonable. House coffee is fair trade and organic. Signature biscuits are sublime. T-shirts commemorating Grateful Bread’s quarter century mark in 2016 proclaim, “Everybody must get sconed!” I did. Highly recommended! Well, of course, I had to check this one out. A PIRATE bakery on the coast? I expected lots of schmaltz and little substance. I was pleasantly surprised. As it turns out, these pirates know their pastries. 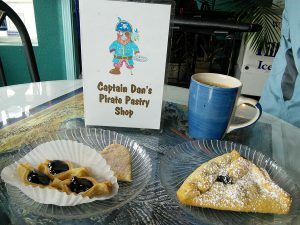 According to Kathy, Captain Dan’s, er, first mate, there are 15 varieties of her signature turnovers including the “Shipwrecked” version (bacon, caramel, apples, and cream cheese). I tried both the marionberry and the blueberry cream cheese. Scrumptious grub, matey! There is a plethora of other bakery booty, like the skull-and-crossbones shaped cookies, cinnamon rolls, and chocolate-dipped pecan bars. No pirate ever had it so good. Depoe Baykery is housed in a bright yellow building with orange trim about two miles north of Depoe Bay. Look closely for its driveway, as it’s easy to miss. The cheerful color scheme continues inside this eclectic establishment where you can find everything from traditional doughnuts and maple bars, to huge and tasty fried pies with fruit filling and cream cheese, and enormous cinnamon rolls and pecan sticky buns, at very reasonable prices. There’s more: three kinds of macaroons—original, filbert, and “Oregon Joys,” filbert macaroons dipped in chocolate. Depoe Baykery probably has more varieties of everything—from doughnuts to cookies to bread—than any other spot on this list. Make the effort to find the yellow house! This is the only bakery I found that allows you to sip that mocha and munch on that croissant with a ringside seat on the Pacific Ocean. Heavenly! 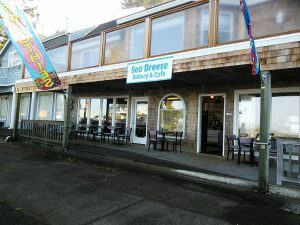 Situated across Hwy 101 from Depoe Bay’s popular bayfront, the bakery features plenty of seating—on its expansive deck, or inside with large windows for ocean viewing. Sea Breeze features the more traditional end of the bakery spectrum. Nary a scone in sight, but cronuts (deep-fried glazed croissants) and doughnuts glazed with orange creamsicle icing were selling fast. And then there are the apple fritters. The bakery claims they weigh two pounds (they do, I checked). And they deliver exactly what fritters should: glazed and a little crunchy on the outside, sweet, doughy and apple-laden on the inside. But please share these with several friends! 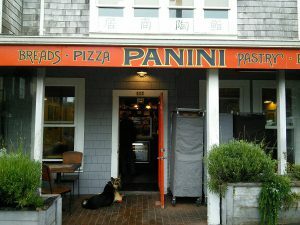 Located in the popular Nye Beach area, Panini has been a community gathering spot for 15 years. It’s also the place to which loyal visitors (like myself) gravitate whenever they’re in the neighborhood. Why? Panini delivers all of the Good Bakery Essentials: an enormous selection, tasty, generous portions, and reasonable prices. You won’t find maple bars and fritters. 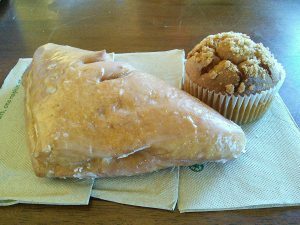 You will find extra large muffins that will see you through to lunch, no prob, king-sized huckleberry scones, blackberry puffed pastry, and chocolate croissants. The focaccia is sold by the quarter pan (huge portions!). When I visit, I often opt for this and share it with a friend, each of us tearing off chunks of the topped-with-roasted-garlic treat. Grab an indoor or (covered) outdoor table and people watch to your heart’s content. When i learned that this bakery had no indoor seating—at first glance, it appeared to be a drive-thru espresso spot—I nearly crossed it off my list. I’m so glad that I didn’t. In about 280 square feet, Edd and Jeni Drescher manage to produce an amazing array of baked goods—and they do it all well and with good humor. I sat in my car (an outdoor patio is available) and enjoyed my tasty egg and cheese breakfast croissant and watched a steady stream of cars stop by for their morning fix. I also tried the Apple Strudel for Two That Nobody Shares (the official name according to Edd; yummy). Other popular treats include bear claws and danishes. Edd and Jeni don’t just dispense good pastries and coffee. They make you laugh, a valuable commodity for their many regulars who are stopping for sustenance en route to work or play. 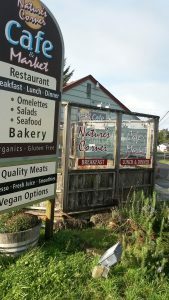 Nature’s Corner is part cafe, part bakery, part natural foods store, where there’s always an assortment of fresh-from-scratch scones, brownies, cookies, muffins, pies, and cakes. For someone like me, who buys mostly organic, this is the place to get bakery items that incorporate organic ingredients like eggs, nuts, oils, fruits, and grains and also offers vegan and gluten-free items. 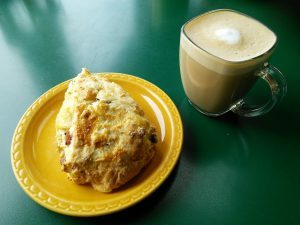 The cafe food is divine, but when you are on the go, the to-die-for walnut bars or huge but affordable cranberry orange scones are ready to be instantly devoured, or I mean, savored with a nice cup of organic coffee. 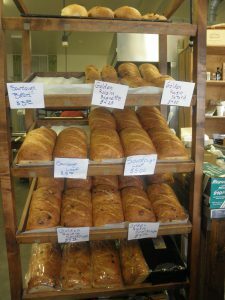 The Empire Bakery, tucked in the back corner of a building in Coos Bay, has a European feel to both the bakery items and the small but charming shop. That may be because the owner, Sam Ryzebol, can trace his baking lineage back to 1650 Holland. Sam’s mom was the original owner of the bakery, who learned to bake from her mom, who learned from her dad who had a bakery, who learned from his dad, and so on. The French and sourdough “sliced” loaves of breads (including the walnut cranberry) are worth the extra cost. 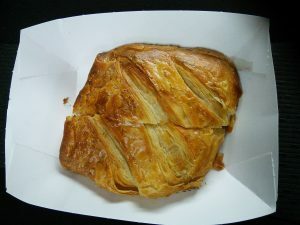 But you shouldn’t leave the place without trying at least one of the pastries, including the apricot glazed croissant sticks or the decadent cream cheese and Oregon berry danish. 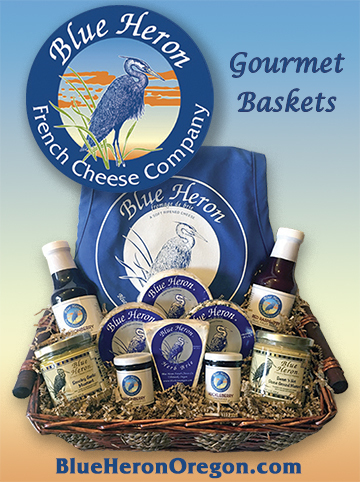 The shop also offers an ample selection of local and international wines, cheese from around the state, and locally roasted coffee. It’s très bon! 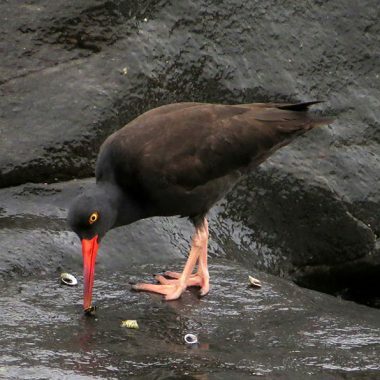 Article published in the January/February 2017 issue of Oregon Coast Magazine.